Dagger fencing is a traditional system that has been passed down from master to student. 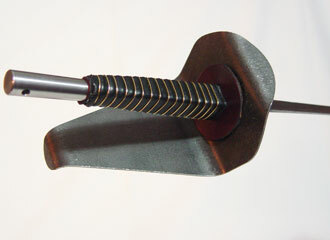 Firmly grounded in the French school, it is a system that includes thrust and cut technique but places its emphasis on thrusting. It utilizes both linear and circular footwork.There are three methods of gripping the dagger, which are the foil grip, the sabre grip and the reverse grip. The type of dagger utilized is the fencing dagger that was developed in France during the late 19th and early 20th century to be employed in the training and practice of dagger fencing and sword & dagger fencing. It is constructed with a short straight wooden grip, thumb pad and a shell guard without a crossbar and a thin straight flexible blade approximately seventeen inches long with a rolled point as in a sabre blade.